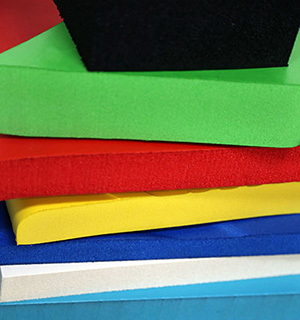 Spongex closed cell PVC foam sheet stock is formulated and manufactured using our unique custom molding process. Our Aqua Cell foam is the perfect choice for use in construction, industrial, medical, athletic, marine and automotive as well as countless other applications. Molded full bun sheet stock (skin on both sides) is available in 1 inch, 1.5 inch and 3.25 inch thicknesses and can be custom ordered to meet your specific requirements, such as: color, fire retardation, and size. Please contact sales@swimways.com for more information and check out our Material Properties and Applications Guide for detailed specifications.